It can be a bit of a culture shock, leaving home and moving into student digs, but it is also a liberating opportunity to surround oneself with decoration that feels entirely personal and just right. Whilst there will undoubtedly be limitations upon the type and amount of decoration, most students will still have plenty of ways to personalise their new mspace. Choosing to study in Edinburgh is a great way for a student to enjoy all the hustle and bustle of a major city, without having to deal with its hectic pace. Edinburgh is a surprisingly compact capital, yet it still manages to be home to a diverse and thriving culture. However, Edinburgh is not the cheapest place to be a student, so those taking up student digs in this interesting city may have to be ready to make some compromises. Fortunately, there are many types of accommodation available to students in Edinburgh. Many students will realise that they will have to share a house or apartment, and there are plenty of landlords offering two, three and even four bedroom apartments. Many of these have been purpose built for students and feature all the amenities and mod cons that they will need. There are even some properties termed “private halls” which provide access to onsite gyms, cinemas and common rooms. 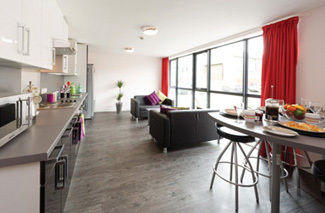 Landlords realise that students have little money and have not yet acquired furniture, so practically all student digs will be fully furnished, with durability and practicality rather than aesthetics in mind. Fully furnished will imply that they have been decorated and furnished to appeal to a wide range of people with various tastes, and a student will no doubt want to personalise it to suit themselves. Many student digs will have only provided single beds, so those students who have been used to a double bed at home may want to invest in one to make it more familiar. Add some quirky bedding, hang a few lights over the headboard and the bed suddenly becomes more personal. 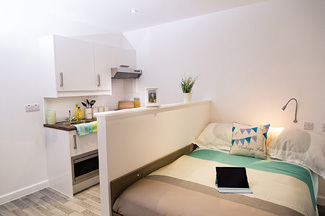 Smaller spaces demand a little inventiveness and smart thinking. Try to think of everything as serving a dual purpose. For instance, a decent-sized bed can be turned into a sofa with the addition of cushions; a computer desk can become a dining table; and footstools with inbuilt storage can become places to sit. To make a small room look bigger, consider putting a mirror either on or against the wall, as this will give the illusion of space. Check with the landlord first in case there are rules about what can be put on the walls, but otherwise use Blu-Tack to put up some favourite posters and prints. Have different levels of lighting so that the mood and atmosphere can be easily changed, but remember to have a strong, directional light for all that studying. To really personalise the space, place some photographs of family and friends, even the family dog, around the place to remind one of home.